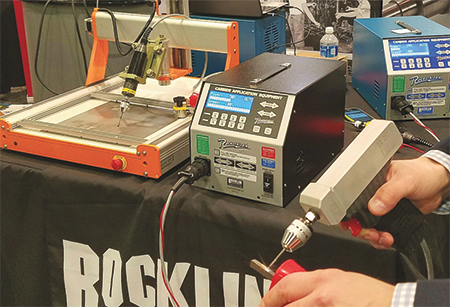 Rocklin Manufacturing Co., Sioux City, IA, demonstrated the Rocklinizer Model 850, which applies tungsten carbide, titanium carbide and hard electrode material in thicknesses from 0.0002 to 0.007 in. to repair metals, tools and dies. The Rocklinizer electronically impregnates and deposits wear-resistant material both underneath and on top of metal surfaces. Unlike welding or metal spraying, no appreciable heat is generated; and the electrode material will not separate or flake off the workpiece. After applying, no heattreatment, grinding or other surface treatment is necessary. Features of this portable unit include a rotary applicator, rapid application, digital readout and touch-panel controls. This surface treatment can increase productivity and reduce costs, state company officials, as tools and dies remain in operation without replacement due to wear, meaning less machine downtime, operator idle time, and expense related to new or resharpened tools and dies. See also: Rocklin Manufacturing Co.